"It's the last day of December, and it's unusually mild at 33 degrees below zero." Premise: This German documentary explores the life of people living along the River Yenisei in Russia. Directed by: Dmitry Vasyukov, Werner Herzog. Written by: Rudolph Herzog, Werner Herzog, Dmitry Vasyukov. 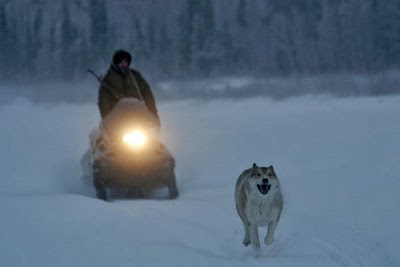 The documentary starts in the village of Bakhtia at the river Yenisei, in the Siberian Taiga. (The Taiga is the surrounding wilderness.) There are no roads; the only way to reach Bakhtia is by helicopter, or by boat. And even boats can only get to Bakhtia during the few ice-free months; otherwise the river is frozen over. Bakhtia has approximately 300 inhabitants, and the majority of them make their living as trappers. Most of the film focuses on these hunters. And, say the trappers spoken to, they are happy. Out of all the opportunities available to them, trapping is the best way to make a living, they explain. One gets to work and live in the beauty of the Taiga, and the only person they must answer to is themselves. The nature and landscape seen in the film is of course stunning. The documentary was filmed over the course of a year, and across the four seasons, and that is the way the film is divided (starting with spring, ending with winter). The trappers we follow are seldom in Bakhtia. There is only a small window of time in which they can hunt, but most of their work is done preparing for the hunting. And they stick to the old ways, being almost entirely self sufficient. The only two modern technologies they use are chainsaws and snowmobiles. Other than this, the men make everything themselves; their own shelter, their own traps, and they catch and prepare the majority of their own food. The men trap alone, and only have their dogs for company. "You are no hunter without a dog," one trapper says. But the companionship the men share with their canines is just a bonus, because the dogs are used practically. Actually, the dogs' presence is discussed extensively in the film. One of the most interesting things, as one man discusses, is the relationship these trappers share with the animals. He explains that some men nearly share a plate with their dog, and let the dog sleep on their cot. Himself? He makes his dog sleep outside, even when it's very cold, and he does not feed it too much. Though, he still says, there is definitely love shared between him and his dog. The film also tackles a major problem in Bakhtia: alcoholism. As one labour worker explains, most of the old ways (such as the critical role of elders) have been lost and forgotten. So now drinking is rampant, perhaps because most men only have their work (monotonous, lonesome, and tough) and nothing else. One aspect in which the documentary is lacking, is that it fails to suggest any solutions (either from the filmmakers, those filmed, or anyone else) of how to heal the problems these humane and modest people face. Seeing into Bakhtia, I was both grateful for and saddened (mostly saddened) by my Westernized life. The trappers in the film claim to be happy, but how pleasant, truly, can such a severely isolated life, killing and constantly working to survive, bring happiness? I think what is meant, is that out of the opportunities available to them, trapping is indeed the best. Happy or not, without having to answer to any government, or anyone else, these hunters really are their own makers, in the good and the bad. "Happy People" is a rare, thought-provoking look into a type of life many would otherwise never be able to see. It's a solid, responsible, and progressive use of the film medium. But when it comes to deeper political issues, and discussion around them, "Happy People" misses the mark.